H. A. Dusenbury sent a donation of $1,000 to Berry on behalf of her aunt, Mrs. Eloise F. Dusenbury, to be used however the schools saw fit. 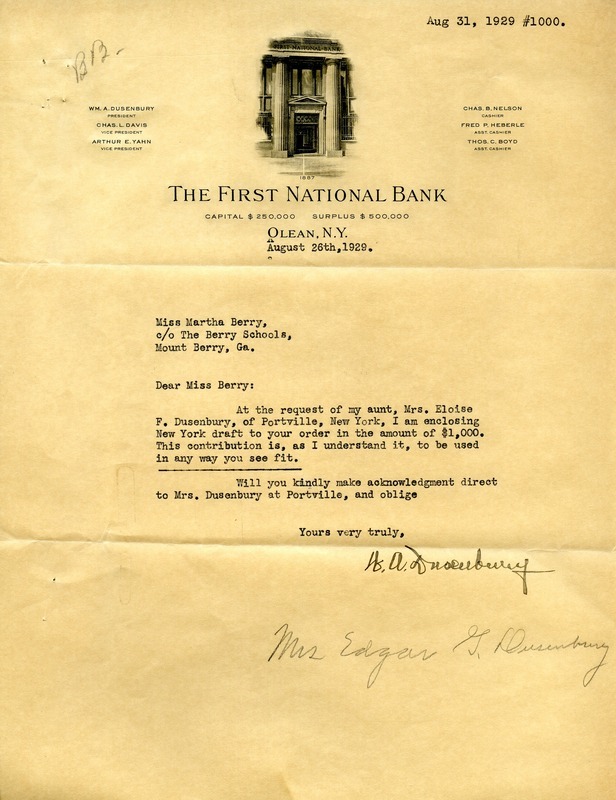 H. A. Dusenbury, “Letter to Martha Berry from H. A. Dusenbury.” Martha Berry Digital Archive. Eds. Schlitz, Stephanie A., Olivia Mund, Hannah Bailey, et al. Mount Berry: Berry College, 2012. accessed April 23, 2019, https://mbda.berry.edu/items/show/9941.